Leaves, be gone! Squirrels, stand clear! When you have the power of a WORX Blower behind you, nothing stands in your way. Maybe you’ve waited until the temps started to cool before tackling your big fall cleanup, but now is the perfect time to set aside time to get the job done. Whether it’s cleaning debris out of your garage, clearing the yard of the first fallen leaves, or starting the next DIY project on your list, durability is the name of the game. Where other tools fail to perform, we have a leaf blower you can rely on to power through your project. A compact design makes our leaf blowers easy to handle, comfortable to use, and lightweight. No need for heavy lifting or maneuvering around patio furniture, which can slow down the process and add unnecessary strain. Plus, our corded blowers are double-insulated to prevent shock from built up static electricity. No hair raising experiences here. Take a quick lap around the yard with your leaf blower by your side, cleaning up sidewalks, driveways, and gutters in no time. You’ll be surprised at how quickly you can get through yard work, especially when you have the power of two-speed control like you’ll find on the new TURBINE Fusion model. Due to this premium efficiency, you will still have plenty of time to partake in more entertaining fall activities. Cider sipping, pumpkin picking, or fantasy football, anyone? When you hit full power, game on for everything you leave in your wake. For triple the action, our all-in-one blower, mulcher, and vacuum is what cleanup dreams are made of. Our patented system has the turbine fan technology to generate maximum performance in less time for all those heavy duty jobs. Don’t worry about waking the neighbors either, if you’re an early bird. Our leaf blowers hold the power, but at a quieter level than those gas-powered noise machines. Safety-focused, power-driven, durable technology and design is what it takes to make sure you have a tool that can withstand the test of time and unpredictability of seasonal conditions. Take your leaf blower power from low to GO this fall. Then, kick back, relax, and pat yourself on the back for a job well done. Blow the leaves off of your sidewalk making them safe for the neighborhood kids. Or attach the WORX Gutter cleaning kit and keep your gutters free from leaves and other potential backups. Clean out the corners of your garage with while keeping items in place. 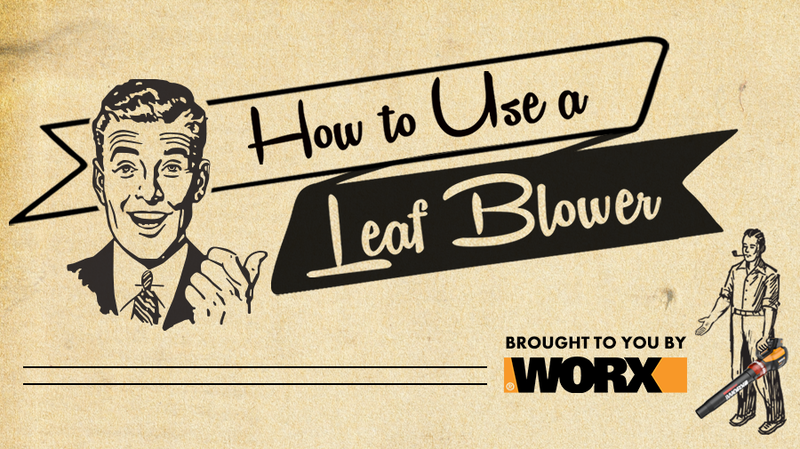 Crank up the blower to build an epic pile of leaves in your front yard. Give the TURBINE 56V CORDLESS LEAF BLOWER a go! Scare neighborhood pests (squirrels, etc) out of your trees and bushes, or send piles of leaves into oblivion with the Turbine Fusion’s mulcher capabilities.